Don’t worry you won’t be the first or last to ask this question. 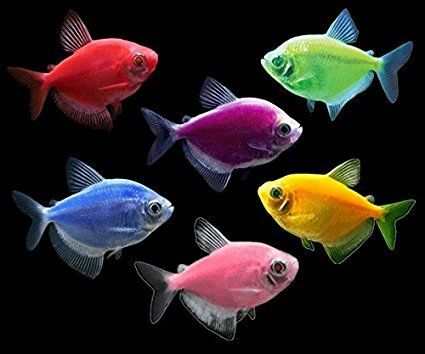 In fact, GloFish® have been around for years but have only recently become more popular as word spreads that these fish are not dyed, painted or fed any weird foods. GloFish® are naturally born and instantly have their bright colors from birth which lasts their whole lifetime. GloFish® were originally engineered for scientific research by using DNA from Marine Organisms in the wild that already have these amazing colors like jellyfish. The color that you see in the GloFish® is produced by an inherited fluorescent protein gene that is passed from generation to generation. The fluorescent protein genes are derived from naturally occurring genes found in marine organisms. Special Glo-Fish Fish Food Available Here! They are not painted, nor are they dyed by feeding them food. Every GloFish® sold are born with these amazing colors. Be warned! There are some fish that have been colored with non-ethical methods but GloFish® are not one of these species. GloFish® were scientifically engineered to detect water pollutants to help save lives. These fish were bred to fight against countless diseases and significantly improve peoples lives and environments. 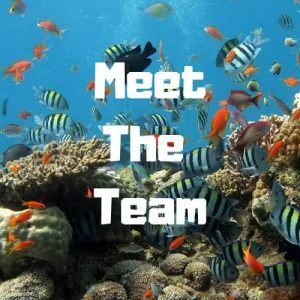 These fish have saved countless lives and are still been used in the research for cleaner water to help undeveloped countries reduce deaths from drinking polluted water. A portion of the proceeds from every sale of a GloFish® goes towards research into water pollution. Helping to make the world a safer place. We take clean water for granted in many parts of the world, many diseases and even deaths are due to poor water. Are GloFish® born this way? YES, Each GloFish® inherits its amazing Fluorescent colors directly from their parents. They maintain their color throughout their whole lives, and they pass their amazing color to the young naturally. The color will never fade and cannot be passed onto any other fish in the tank. This is a topic that could last for hours. In our opinion, no fish were ever harmed in producing the amazing colors. Originally their eggs were injected with DNA from marine species like jellyfish and other marine organisms which gave them their fluorescent colors. Should they have ever tampered with nature in the first place? Well, that’s a big question to ask and you have to answer that one for yourself. All we know is these fish were bred to save human lives, not for fishkeeper gratification. Since that one injection into their eggs many years ago, no other form of tampering or altering the genes of these fish has happened since. 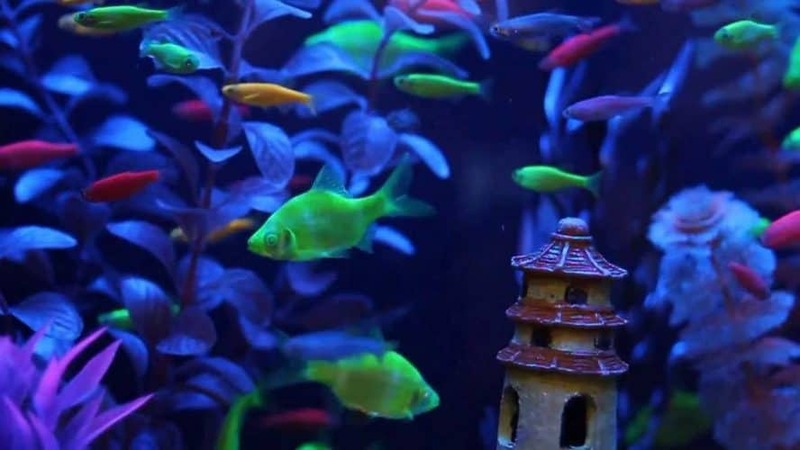 GloFish® were offered to the general public when demand for them increased. Once people knew how and why they have been bred aquarists started to buy them. They also realizes how much money for research could be raised from selling them to the general public. Many shops and leading aquariums now stock these fish. They are also available to order online from stores like LiveAquaria. Remember some of the proceeds from each sale goes into water pollution research, helping to provide cleaner water for people to drink all around the world. Are all fish available in these colors? No, Only fish from the originally registered supplier are true GloFish® and they only come in six colors. What if they escape to the wild? These fish pose no threat if they escape to the wild. They are tropical fish and will not survive outside their tropical fish tank environment. Like other non-fluorescent friends they have been bred and sold in aquariums for over 40 Years and are still only found in aquariums. You don’t see big shoals of Neon Tetra’s in the river, do you? If another bigger fish eats them will they turn fluorescent? Just like if a bigger fish eats a bright blue Tang or an Orange and White clownfish they don’t turn that color. Do they? Their fluorescence is derived from a gene that is already found in nature and is completely safe for the environment. You cannot transfer the color from digesting a fish which contains the gene. Are GloFish hard to keep? In fact, these fish are very hardy and make excellent first fish. Young children love them because of there colors and lively activity. We would recommend keeping these peaceful fish by themselves in a small-Medium aquarium or in small schools with equally non-aggressive fish. Since they are omnivores, GloFish® will eat a varied diet of flake and frozen foods. They require good quality water like all Tropical Fish and regular water changes will help keep the water they live in safe and healthy. The same rule also applies to feeding your GloFish as it does with all tropical fish… Don’t overfeed them. By overfeeding your fish you are harming the water quality they live in which can result in disease and even death. A tank of 10 Gallon is the minimum size you should consider using. GloFish even have their own brand of fish tank with lighting and fluorescent plants and Ornaments that will only increase the color of your tank and wow your friends and Children. For a good Aquarium buying guide click here! Let’s have a quick recap! We hope we have answered your question about How are GloFish made? if you have any more questions please leave a comment and we’ll do our best to answer it as quickly as possible. i still have one question; are they saltwater or freshwater? They are Freshwater fish !